A few thousand of this marine species visit Britain every winter, thought to be from the northern Norway and Russia part of their circumpolar breeding distribution, but they nearly all stay in Scottish waters. Like other sea-ducks they dive for their diet of molluscs, especially the Common Mussel Mytilus edulis, but also take other bivalves such as cockles, clams and gastropods such as periwinkles and whelks. When they visit inland sites they probably eat crustaceans and fish such as sticklebacks. They have always been scarce in Cheshire and Wirral. Coward (1910) wrote that they were seldom met with on the west coast of England, but occasionally immature birds have been obtained in autumn and winter in the Dee estuary. He was able to list just four winter records, from December 1839, December 1886 and November 1900 (two birds). Bell (1962) thought that this understated their true status, since from 1950 on it had been recorded each year in very small numbers, usually singly, ‘and this is substantially true for the earlier years from at least 1930’. Since then, the annual county bird reports show about 48 coastal records, of around 77 birds, in the forty winters from 1964/ 65 to 2003/ 04. They were recorded in 24 of the 40 winters. Inland occurrences have become much more frequent. Bell (1962) knew of only six inland winter records in sixty years, but the county bird reports show about 29 records, of up to 40 birds, in the forty winters from 1964/ 65 to 2003/ 04. They are never common, however: apart from a flurry of records from 1979/ 80 to 1981/ 82, there have seldom been inland records at more than one site in a winter. The records during this Atlas represent an increase on those in recent years; all but one were in winter 2004/ 05 so this is not an effect of aggregating three winters. Inland, two birds were on the River Weaver (SJ57P) on 28 February 2005 and the Chelford sand quarries (SJ87A and SJ87B) provided the home for two different overwintering birds, a male and a female, throughout winter 2004/ 05. 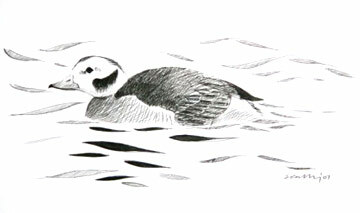 A feature of inland Long-tailed Ducks has often been their propensity to stay for long periods, and these two were true to form. In their more normal coastal habitats, single birds were seen in both of the tetrads at Hilbre (SJ18Y and SJ18Z), one of the species’ most regular haunts, and two birds were off the north Wirral shore at Hoylake (SJ29A). Finally, from mid-February 2005, a drake was on West Kirby Marine Lake (SJ28C/ D), continuing its long association with the species first recorded seventy years ago when Farrer wrote ‘nowadays a walk along West Kirby Promenade during the winter months will generally result in a view of long-tails fishing in the Marine Lake’ (Farrer 1938).